Peering deep into the heart of our home galaxy, the Milky Way, the NASA/ESA Hubble Space Telescope reveals a rich tapestry of more than half a million stars. Apart from a few, blue, foreground stars, almost all of the stars pictured in the image are members of the Milky Way nuclear star cluster, the densest and most massive star cluster in the galaxy. 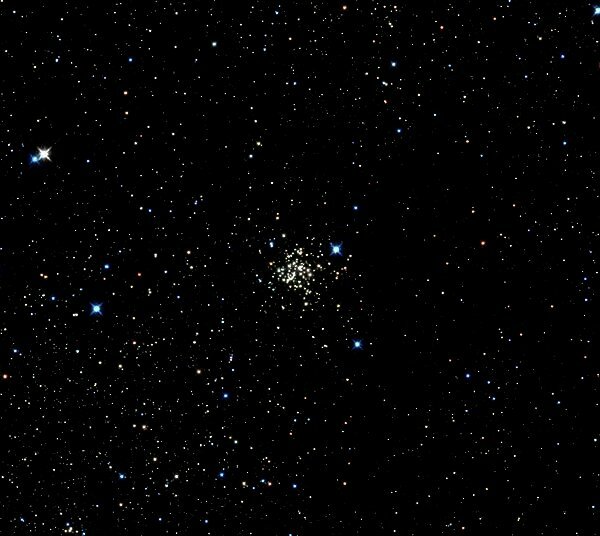 Hidden in the center of this cluster is the Milky Way’s resident supermassive black hole. The center of the Milky Way, 27 000 light-years away in the constellation of Sagittarius, is a crowded place. This region is so tightly packed that it is equivalent to having one million stars crammed into the volume of space between us and Alpha Centauri, located 4.3 light-years away. At the very hub of our galaxy, this dense nuclear star cluster surrounds the Milky Way’s central supermassive black hole, known as Sagittarius A*, which alone is about four million times the mass of the Sun. Sagittarius A* is not the only mystery lurking in this part of the galaxy. The crowded center contains numerous objects that are hidden at visible wavelengths by thick clouds of dust in the galaxy’s disc. In order to truly understand the central part of our galaxy astronomers used the infrared vision of Hubble to peer through this obscuring dust. To reveal the image in all its glory the scientists then assigned visible colors to the different wavelengths of infrared light, which is invisible to human eyes. Using Hubble’s vantage point above the atmosphere and its high resolution, astronomers were able not only to reveal the stars in this cluster but also to measure their movements over a period of four years. Using this information, they inferred important properties of the nuclear star cluster, such as its mass and structure. The motion of the stars may also offer astronomers a glimpse into how the nuclear star cluster was formed—whether it was built up over time from globular star clusters that happened to fall into the center of the galaxy, or from gas spiraling in from the Milky Way’s disc to form stars at the core.